Biofuels – fuels derived from biological sources such as plants or algae – have a lot going for them, most notably their environmental friendliness. But they’re not without problems. 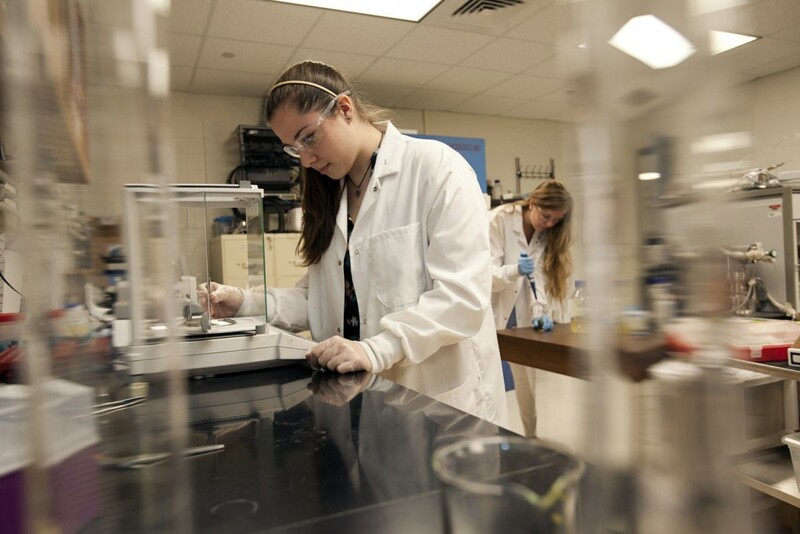 Rebecca Miller ’16 works with biofuel samples. Imagine parking along Cattell Street in January, for instance, and coming out to find that your fuel has solidified, literally turned into a wax-like substance that has clogged your vehicle’s injectors, pipelines, engine, etc. Not a great start to the day. A research team led by Michael Senra and Lindsay Soh, assistant professors of chemical and biomolecular engineering, is studying the cold flow properties of biofuels by examining how a fuel’s composition influences its behavior at colder temperatures and incorporating natural additives to lower the fuel’s melting point. Chemical engineering majors Stephanie McCartney ’17 (Abingdon, Md.) and Rebecca Miller ’16 (Weaverville, N.C.) and Rachel Elias ’17 (Towaco, N.J.), who is pursuing degrees in chemical engineering and environmental science, are working on the project through the EXCEL Scholars undergraduate research program. Biodiesel is derived from oils which exist as both solids and liquids – think butter or olive oil at room temperature, explains Soh. Most biofuels, then, will solidify at colder temperatures, making pure biodiesel impractical in the wintertime or even on cool fall or spring evenings. The temperature at which the liquid transitions to solid is due largely to the biofuel’s composition, which in turn is influenced by the source of the biofuel, adds Senra. 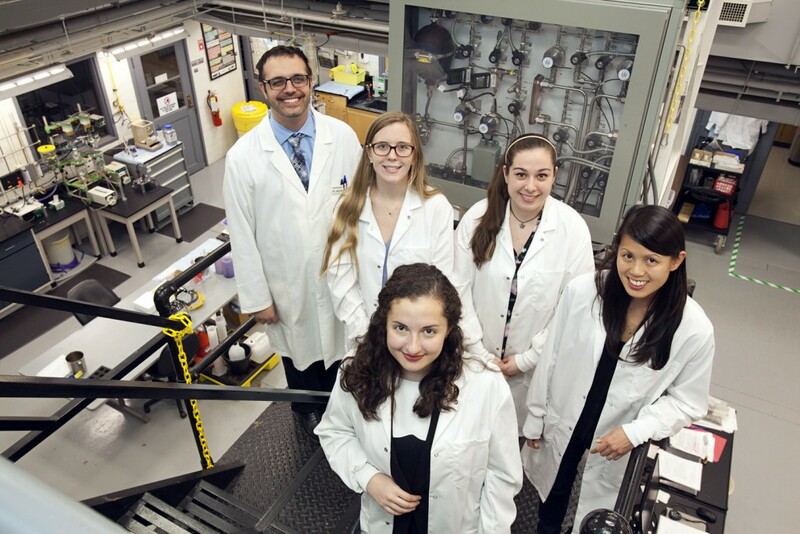 Members of the biodiesel team, Professor Michael Senra, Stephanie McCartney ’17, Rachel Elias ’17, Rebecca Miller ’16 and Professor Lindsay Soh. Elias has been with the project for about two years and is studying a potential additive called triacetin. In addition to lowering a fuel’s melting point, triacetin also is promising because it can be created as a co-product of the biodiesel synthesis reaction, meaning there is no secondary cost of producing or purchasing it. She also is studying how well predictive thermodynamic models apply to biodiesel blends with triacetin. Modeling cold flow properties will allow for researchers to predict how various biofuel blends will act as temperatures drop. Similarly, McCartney is studying the effects of the additive dimethyl azelate on biodiesel cold flow properties. Always interested in protecting the environment, McCartney realized she could apply her major to biofuel research when she took a course on alternative energy. After making biodiesel from algae, she was hooked and plans to pursue a Ph.D. with a focus on alternative energy research. The project has allowed Elias to bridge her interests in chemistry and environmental science. She, too, plans to attend graduate school and pursue a career in energy research. The EXCEL program, she says, delves much deeper than lab-based courses.